Every two hours, bowel cancer claims a life in Australia. As the new Patron of The Jodi Lee Foundation, iconic Australian, Ita Buttrose, wants to encourage you to talk about your bowel movements. Australia has one of the highest rates of bowel cancer in the world. Nearly 17,000 people are diagnosed with bowel cancer each year and by 2020, this number is expected to increase to almost 20,000 bowel cancer cases detected annually. And it’s not just middle-age Australians and the elderly who are at risk. Last year 1,313 people under the age of 50 were diagnosed with bowel cancer, representing 9 per cent of the total number diagnosed. 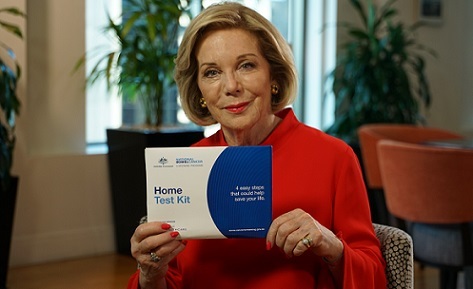 Having lost a brother and a close woman friend to bowel cancer, Ita Buttrose wants to convince all Australians that the subject of their bowel movements shouldn’t be avoided. Ita Buttrose, who has long been at the forefront of breaking down barriers with regard to taboo topics, is now a Patron of The Jodi Lee Foundation and using her influence as an iconic Australian, for a good cause. Established by Jodi Lee and her husband Nick, in honour of mother who died at the age of 41 from bowel cancer, the Foundation works tirelessly to empower people to take steps to prevent bowel cancer and act quickly on symptoms. The Foundation’s medical expert, Dr Dan Worthley, agrees that it’s a myth that bowel cancer only happens to older people. “The test, which is looking for invisible traces of blood in your poo, involves collecting samples smaller than a grain of rice. It’s also important to know that the user-friendliness of the government test has improved, thanks to feedback from participants,” she said. The Jodie Lee Foundation website is a one-stop bowel cancer resource – their ‘Trust Your Gut’ section shares preventative measures including diet and exercise tips, symptom checkers, real life stories and how to get tested. Visit jodileefoundation.org.au for more information.